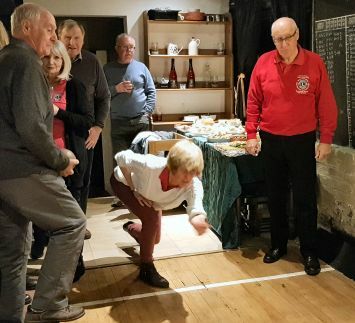 Fleet Lions enjoy a full and varied social calendar ranging from informal 'Drink and Chat' evenings at local pubs to smart/casual lunches and dinners, skittles matches, barn dances, theatre visits and in fact anything you'd like to suggest. Lions Christmas Lunches can be a bit of a riot! Peter, Brian and Fred aided and abetted by Travis, entertain Fleet Lions and guests after our Christmas Lunch at the Farnham House Hotel.